Edison's New Village cement plant -- finally found! I've driven on Thomas Edison's Concrete Mile many times over the past few years, knowing his Portland cement plant wasn't far away. The inventor laid this stretch of State Highway 57 in 1912 to test the effectiveness of concrete as a paving material, yet another of the experiments he was constantly performing to perfect his products. 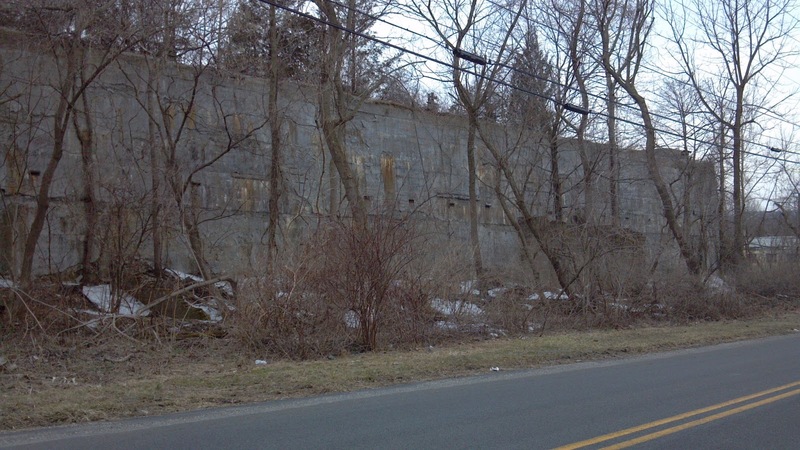 For as many Edison sites as I’ve tracked down, and for as many concrete houses as I’ve found over the years, I’d never located the exact site of the factory. I’d always left it for another day, passing through the community on my way to check out a lead on another story. On the recent Route 57 trip, I decided to take a gander. A good practice in directed exploring is to look for the right names, as streets were often named for the people who lived there or the businesses that were located along them. 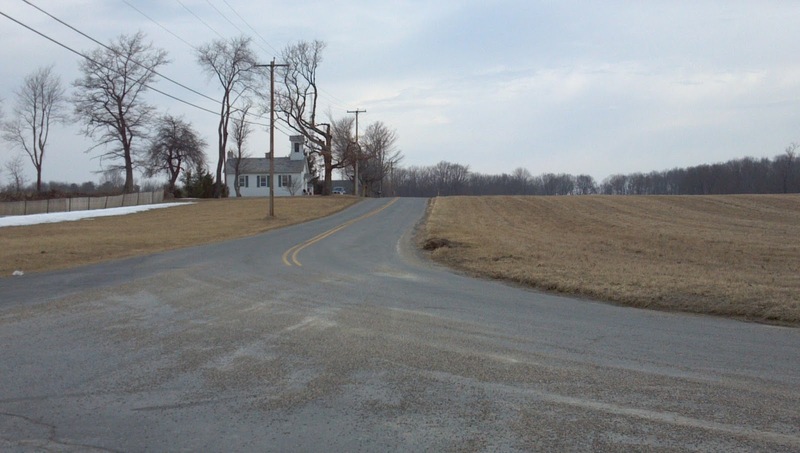 Thus, once I saw Edison Road in Stewartsville, I took the turn. Couldn't hurt. Older buildings and homes near the intersection with 57 soon gave way to side streets lined with houses of more recent vintage, and eventually farm fields. The road coursed under an aged railroad overpass, and as it curved, a large concrete building stood almost directly in front of me. The company sign in front of it is of recent vintage, but the factory definitely looked as if it could be over a century old. Driving further, I saw evidence of other structures that had once stood nearby but were now pretty much in ruins. Yup, I'd found the last used and perhaps best-preserved portion of the Edison Portland Cement plant. The business was, to use a well-known bromide, the lemonade to the lemon which had been his iron ore concentrating business in Ogdensburg. Though he lost about $2 million trying to manufacture high-quality iron, he’d recouped some money by selling the byproduct - pulverized rock – to cement companies as an ingredient in their product. Seeing an opportunity, he moved the rock crushing equipment from Sussex Mountain to lime-rich Warren County and started his own Portland cement company. 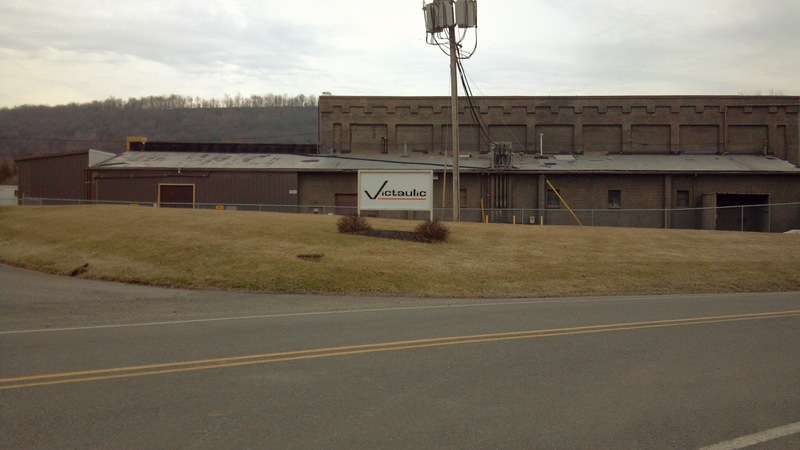 The 1600 acre, 60-building facility grew to include the existing factory, lime crushers and a large rail yard to transport finished product out to market. 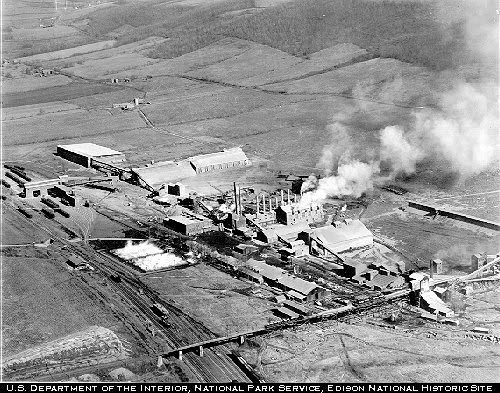 Per his practice of innovating within whatever industry he focused on, Edison introduced a long rotary kiln at Stewartsville that he soon licensed to other manufacturers. Ironically, the design made cement production so economical that it was difficult to make a profit. Contrary to popular belief, Edison didn't do very much of his own construction through his cement business, aside from some test pourings of a garage and potting shed at his Llewellen Park home and a couple of houses in Essex County. He was more interested in selling molds and cement to others to build the pre-fab homes. Charles Ingersoll, for one, constructed several houses in Phillipsburg and Union for working class laborers. The most notable use of Edison Portland cement, however, stood on 161st Street in the Bronx. Yankee Stadium may have been the House that Ruth Built, but it was actually poured thanks to the Wizard of Menlo Park. It's said that during the stadium's renovation in the early 1970s, the concrete stubbornly refused to budge, and was left intact. A concrete ruin aside Edison Road. What was it? We don't know. At its peak, the plant employed over 600 workers, some of whom commuted from as far away as Easton. Eventually, though, it and the nearby Vulcanite Company had pretty much depleted what limestone in the area that could be economically accessed. The plant shut down in 1935 and went out of business for good in 1942. The present occupant of the plant building has been there since 1975, operating profitably among ruins of the other structures that once served the Edison operation. What those concrete slabs were intended for isn't clear, but those visible from the road stand as testament to Edison's tenacity. They may not be as perfect as they were when first poured a hundred years ago, but I'd venture they'd be pretty hard to demolish. If you've driven along Route 57 in Warren County, you may have noticed some curious names on road signs. Within the larger towns are a few hamlets whose names start with the word "Port": Port Colden, Port Warren, Port Murray. While the Musconetcong River flows not far away on the border with Hunterdon County, it's not nearly sizable enough to support heavy traffic, and certainly not three ports, let alone one. And, well, none of these communities are actually on the Musconetcong. So why the name? Each of the communities owes its existence to the Morris Canal, the engineering marvel built in 1824 to connect Phillipsburg and Jersey City to transport Pennsylvania coal east and New York merchandise west. 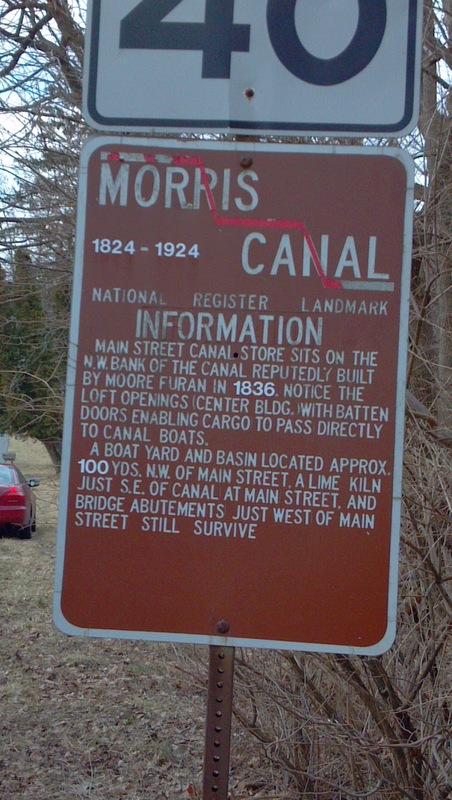 The canal itself should be the subject of a future Hidden New Jersey account (which Ivan keeps threatening to write), but for the sake of today's story, let's just say that since its abandonment in 1924, much of the route of the Morris has been obliterated. Portions in Newark and Jersey City have been transformed to other transportation uses, but as for the rest, with the exception of small portions here and there, you'd need a map. 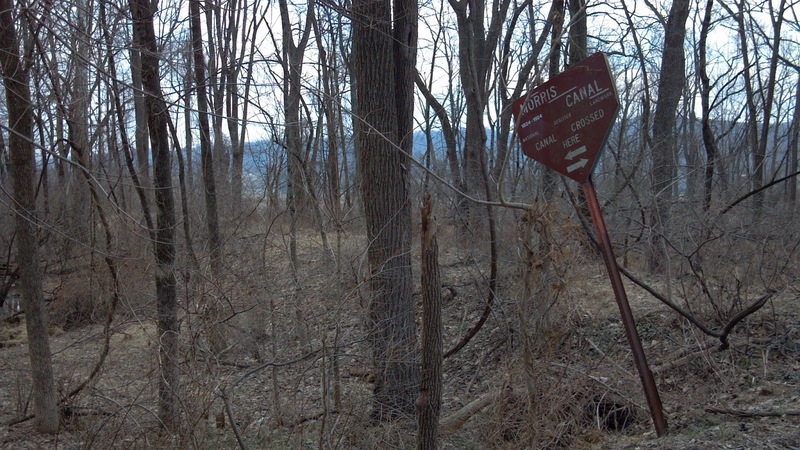 In certain parts of Morris and Warren Counties, you can't miss the occasional brown pentagonal sign marking the route. It seems to cross some roads so often you question the sobriety of the original planners. Without the signs, though, only a trained eye would be able to identify the brush-lined depressions as the bed of the old canal. “Port” towns grew at some of the canal locks or planes where mechanical devices helped barges adjust to the inevitable ups and downs of the North Jersey terrain. Named for executives of the Morris Canal & Banking Company, Ports Colden and Murray were founded in the hopes they’d become boom towns as barge traffic increased. Today, they’re not much more than enclaves of homes, some older than others. Streets named "Canal," "Lock," "Towpath" or "Plane" hint at what drove the creation of the communities, but when I visited recently, I found little left to indicate any prosperity the canal might have brought. You’d be forgiven for missing Port Colden from Route 57. 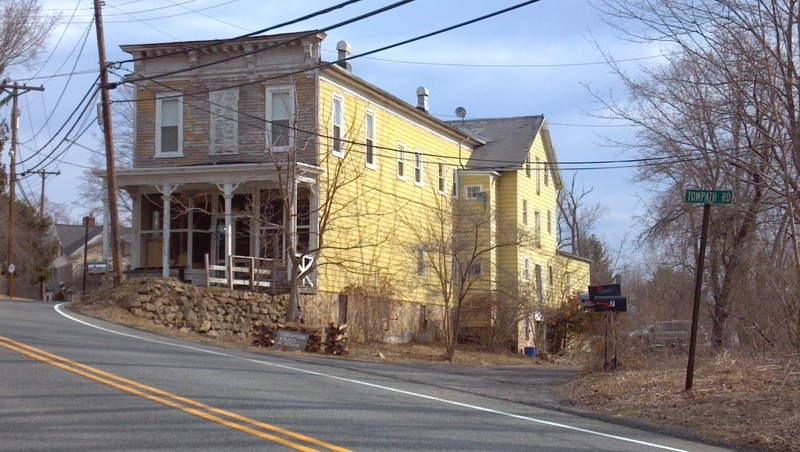 Though a sign points to the appropriate turn-off from the westbound lane, it’s easy to overlook, and the elevation of the highway obscures the most obvious structure from the road, the Port Colden Manor. 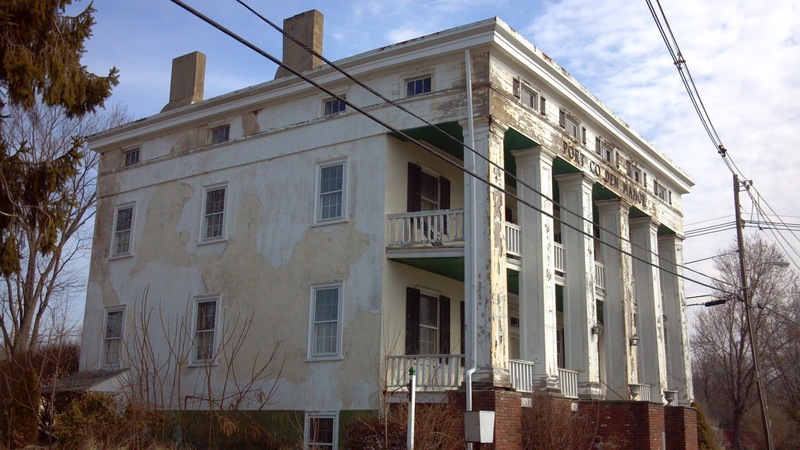 Both stately and in need of some TLC, the building makes an impressive introduction to town. Port Colden Manor, a shadow of its former grandeur. Port Colden had apparently already suffered from the loss of the canal by the time the Federal Writers Project folks got around to visiting in the depths of the Great Depression. 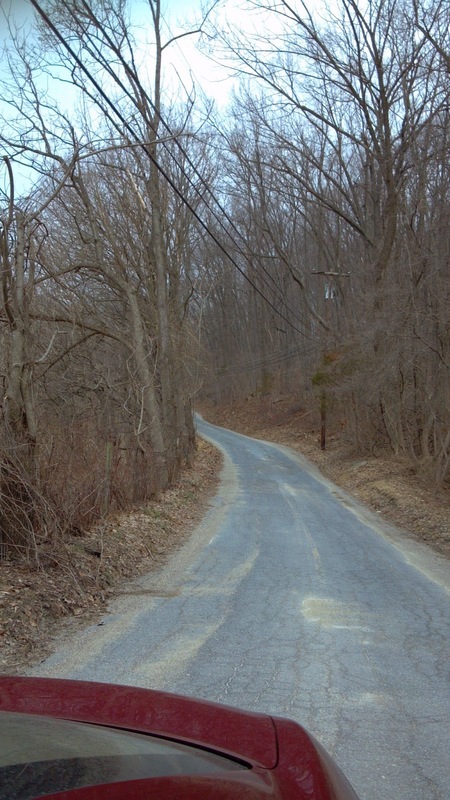 The WPA Guide to 1930s New Jersey describes it as "a ghost town; its few old homes and yellow hotel are a faint echo of the days when the community was a port on the now abandoned Morris Canal." I didn’t see anyone outside as I drove around, but to call Port Colden a ghost town is a bit of a stretch. Yes, some of the older properties could use some attention, but the grade school and a newly restored community church clearly indicate that there’s life there, despite the long-ago loss of the canal. A sign just off the highway notes that the enclave is a historic district; hopefully that’s giving some impetus to bringing some attention. Along the canal in Port Murray. To the west, Port Murray was once considered to be the most important village in the area since it hosted both the canal and the only railroad station for miles. Today, the community seems a bit more lively than Port Colden, if just a little. Main Street boasts a couple of specialty stores as well as a post office and the municipal offices for Mansfield Township. An older building at the corner of Main Street and Towpath Road looks as if its storefront has been unused for a while but could have been a great general store and supply stop for barge crews. It was once, in fact, Perry's Store, where cargo was loaded onto and removed from barges directly from a second floor bay. The thing that struck me about both communities was the lack of daily commerce -- places you could walk to for a gallon of milk, a dozen bagels or maybe a morning coffee. I guess it's just a matter of progress. Warren County isn't exactly McMansion central, but housing developments have sprung up over recent years, bringing big box stores and strip malls with them. Maybe the corner stores and delis have disappeared as the big Shop Rites and Walmarts have moved in and people would rather drive than walk to do their shopping. Either way, it's kind of a shame. How cool would it be to get your morning paper in the same place where canal mule tenders once bought their provisions? Back a few years ago, our visit to Newark's Military Park revealed that America's first school safety patrol was established in New Jersey's largest city in May 1916. 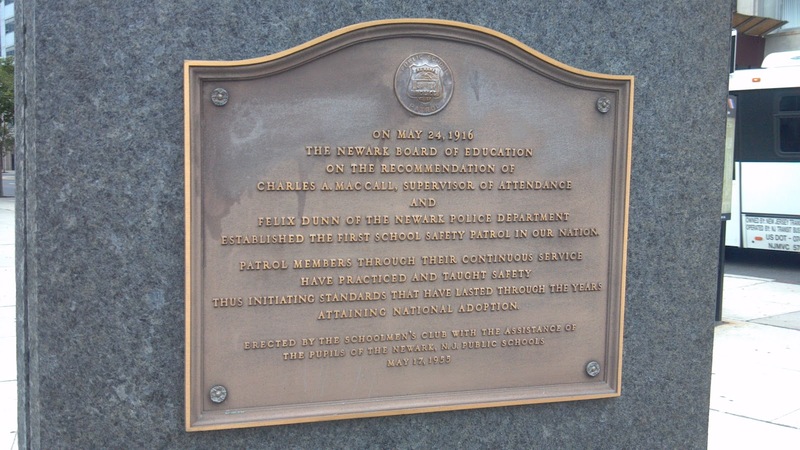 According to a commemorative plaque placed by the Schoolmen's Club, Newark Schools Attendance Supervisor Charles MacCall and Officer Felix Dunn of the city's police department recommended that the board of education start the patrol to make sure that children learned to cross the street safely on their way to and from school. What sounds like a pretty obvious concept now -- why wouldn't a kid know to wait to cross the street until cars passed or came to a stop for them -- wasn't at the time. Automobiles were a fairly recent phenomenon, and as traffic increased, the simple act of crossing the street became fraught with potential injury. Guard stationed at intersections and crosswalks would make sure kids passed safely while drumming the "look both ways, then cross" mantra into their brains. The Newark program brought it one step further by enlisting students as guards, perhaps thinking that kids would be more likely to listen to their peers. In researching the program, I found that the school safety patrol concept, like many good ideas, has been claimed by many parents. It took a while for me to find a non-Schoolmen's reference that placed citing the birth of Newark's program before others. Some branches of the American Automobile Association claim that AAA originated the idea in 1920, while cities like St. Paul, Minnesota proudly state that their safety programs took root in the early 1920s. To be fair, AAA once recognized that safety patrols seem to have sprung up in many areas at around the same time. A 1940 New York Times article said that the organization was attempting "to find and to honor the far-sighted leaders who pioneered the movement." By then, 300,000 children had donned the familiar safety patrol belts to help to keep their peers safe from oncoming traffic. Even the originators of the Newark movement seem to be in question. A 1949 obituary states that Eugene Sheridan, not MacCall, was the public schools attendance bureau director who came up with the idea and worked with Dunn to implement it. I haven't been able to clear up the discrepancy, but I discovered that Sheridan was lauded by the AAA as one of several pioneers at a massive safety patrol parade in Washington, DC in 1941. By the time he retired, almost 3400 Newark youngsters were serving as guards, and no fatal accidents had occurred at any of the patrolled intersections or crosswalks since the start of the program. Dunn headed the Newark School Safety Patrol from its formation in 1917 until his retirement in 1930, and while he did so much to ensure childrens' safety on the road, his family was touched by a car accident. In 1933, he was driving with his wife from Fort Lauderdale to Newark when a tire on their car blew out and the car overturned. Mrs. Dunn died from her resulting injuries, while Mr. Dunn suffered only minor injuries. Today it sits at the edge of New York Harbor, suffering from enduring damage suffered at the hand of Hurricane Sandy. A hundred years ago, it was a busy way station for immigrants coming to the United States to start a new life. No, it's not Ellis Island, though Ellis is still making its way back from Sandy-inflicted wounds. 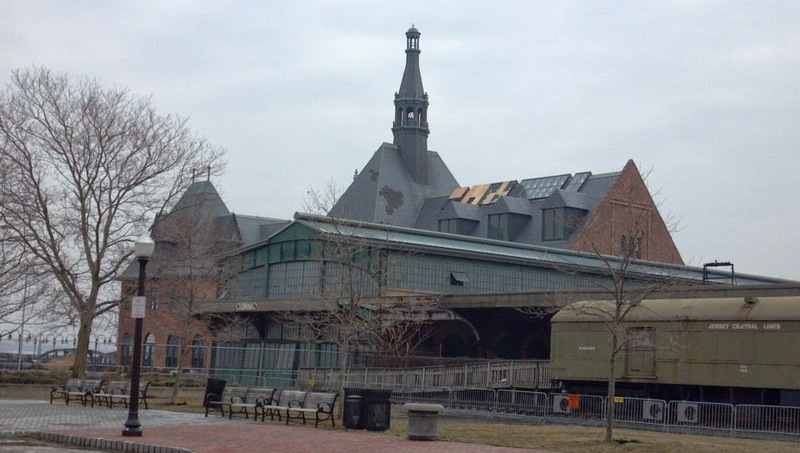 It's Jersey City's Central Railroad of New Jersey Terminal, which continues to await repair, more than a year after the storm. The eaves of the CRRNJ Terminal, in early 2011. As I mentioned in a previous story about Communipaw Cove, the terminal was built in 1889 to replace an earlier structure as the northernmost destination served by the CRRNJ. By the dawn of the 20th century, its adjacent rail yard was the largest in the metropolitan area, serving nearly 300 trains a day, whether for passengers or freight. New York-bound commuters from Hudson, Union, Middlesex, Somerset, Warren, Monmouth and Hunterdon counties would pass through the terminal to transfer between the train that brought them from home and the ferry that connected to lower Manhattan. As they rushed to make their connection, few if any would have noticed that in a separate waiting room sat a nervous contingent of new arrivals, making a much less routine transfer. The northern face of the station, a few months after Sandy. A fair amount of the traffic growth at the terminal was the product of a massive increase in immigration to the United States. 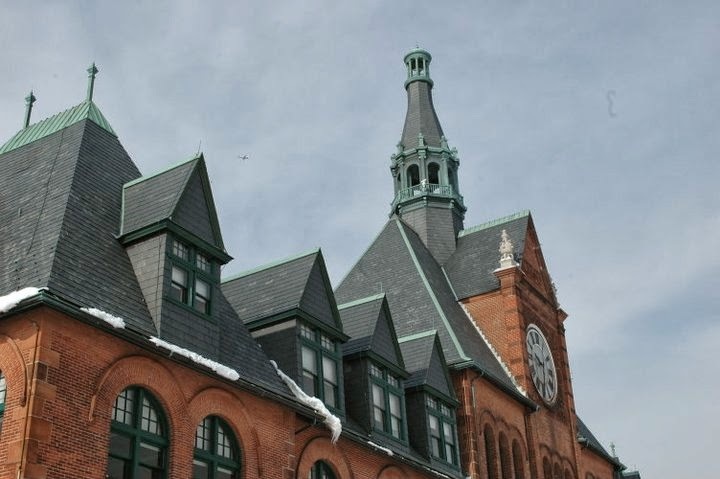 About 70 percent of the 12 million immigrants processed at Ellis Island between 1892 and 1924 were headed to points outside New York, and the CRRNJ Terminal was the first place they landed after they were approved to enter the country. Many had purchased their train tickets before leaving home, in a package deal with their ship's passage, but a ticket office at the Immigration Station was also available for those who still had to plot their course to their new homes. Ferries shuttled them from Ellis to the waterfront station, where they could take trains to their ultimate destination, either directly or through transfer. Operating out of the Jersey City terminal in a cooperative agreement with the CRRNJ, the Baltimore and Ohio Railroad offered direct passage to points as far west as St. Louis and Chicago. The Reading Railroad also supplemented the Central Jersey with service to western Pennsylvania and Philadelphia. On their arrival from Ellis Island, immigrants were guided to a separate waiting room for their trains to be announced, at which point they'd take a designated route to the appropriate platform. It was likely a practical decision, a means to ensure that confused, non-English speakers wouldn't inadvertently board the wrong train and end up in Carteret instead of Cleveland. Similarly, during the heaviest migration years, entire cars of trains would often be designated solely for immigrants. Unfortunately, the Immigrant/Emigrant Waiting Room no longer exists, having been part of a ferry shed which was demolished many years ago. And I haven't been able to find any official word on when repairs to the building itself will be completed, or for that matter, start. Who knew that six degrees of Kevin Bacon would bring us to Morristown? We certainly weren't thinking in that direction when we stopped to read the historic marker posted in front of the house at 17 Dehart Street. It's not until you do a little research that you come to see some parallels to the story of a young man who brings dance to a town where it was forbidden. Well, parallels through a mirror, because the whole thing happens in reverse. There's little to be found about the life of Monsieur Louis Sansay before his arrival in Morristown in the early 1800s. Some digging revealed a Louis Sansay who was married to Leonora Sansay, author and confidante of Aaron Burr, but all evidence points to that Louis being another person altogether. (A shame, because that story is a classic Burr entanglement.) The dancing Sansay might have been a French nobleman who escaped his home country during its revolution, or perhaps he'd come to the New World to aid the Americans against the British. Others opine that he may have arrived here from Saint-Domingue, seeking refuge from the Haitian revolution. Or maybe he was, like so many before him and since, looking for new adventure in a new land. We don't know. What we do know is that his dancing school was very popular among the well-to-do locals, who were more than happy to send their children to him to learn the graceful steps of the time. In time, he became the best known dance master in New Jersey, with a loyal following and monthly recitals performed by the young ladies and gentlemen under his instruction. Sansay's renown seems to have made his home the logical choice to host the dance ball to honor the Marquis de Lafayette during his July 1825 visit to Morristown. Touring the United States as the "nation's guest" at the invitation of President James Madison, Lafayette was revered for his contributions to the fight for American independence, and the opportunity to entertain the hero said much about Sansay's standing in the community. The Lafayette fete, however, seems to have been the apex of Sansay's career in Morristown. A growing temperance movement, fueled by the fiery sermons of Presbyterian minister Rev. Albert Barnes, led to dwindling enrollment in dance classes. Gentle minuets and waltzes were characterized as earthly pleasures luring young students away from faith and worship; God-fearing parents would not allow their children be led astray. Deprived of his livelihood, Sansay closed the school and departed town, leaving Morristown less than footloose. What became of Sansay is as much a mystery as his life before Morristown. Some say he moved to Elizabeth, but I've found no evidence of that. One does wonder, however, about the survival of his legacy among his students. Did they continue to dance together despite the minister's admonitions? Perhaps they found a barn outside of town where they could share their love of movement away from disapproving eyes. Keep your eyes open in the remarkable colonial community of Bordentown, and you'll find the intersection of art and patriotism. 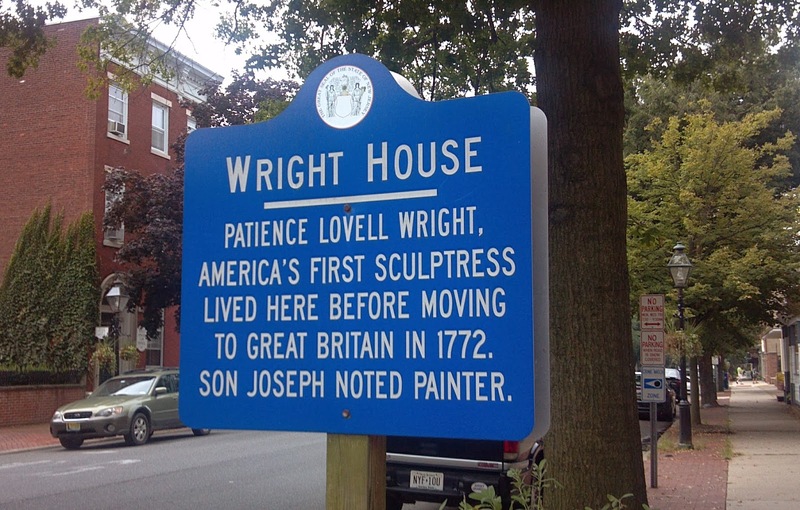 Standing directly across the street from the home of composer, poet, satirist and statesman Francis Hopkinson is the former dwelling of America's first native-born sculptor, Patience Lovell Wright. Justifiably admired for her artwork, she's also rumored to have been a spy during the Revolutionary War. Like Hopkinson, Wright wasn't born in New Jersey, but the then-colony was important to her formative years. A few years after her 1725 birth in Oyster Bay, Long Island, her family settled near the Delaware River in a community that would later be named Bordentown. Strict Quakers, her parents adhered to a rather hard-core lifestyle, demanding that Patience and her sister Rachel wear white in public and conform to a strict vegetarian diet. Nonetheless, the girls found an outlet for their creativity by molding forms from clay they made from flour and water. Patience is said to have been a headstrong young woman, leaving her parents' home at the age of 16 to live in Philadelphia. Several years later, she married the much older Joseph Wright and returned to Bordentown. Though she later observed that her husband had "nothing but age and money to recommend himself," the couple had four children; a fifth was born not long after Joseph's death in 1769. Left with the family house but no other allowances from Joseph's estate to support her children, Patience turned to the craft that brought her so much pleasure as a child: sculpting. The fashionable medium of the day was wax, and with the endorsement of her neighbor Hopkinson, she soon became well known for her extraordinarily accurate, life-sized renditions of human subjects. She and Rachel opened waxworks in New York and Philadelphia, and Patience in particular drew attention for her particularly earthy work practices. One could say that she set the standard early for the quirkier American artists to come. Given the properties of wax, the medium had to be kept warm to be pliable, an especially important detail for Patience's lifelike renditions. She'd cradle the large blocks of wax under a cloth in her lap, engaging in frank conversation with her subjects as they sat for her. When she finished sculpting a bust, she'd unveil it dramatically, as if she were giving birth to it. Following a fire at her New York studio, Wright left the colonies for London in 1771 at the recommendation of Benjamin Franklin's sister Jane Mecom. The Franklin connection was her entre to the upper classes of English society, who were fascinated by her talent and her plain-spoken, egalitarian ways, as much as they were taken by the flattery she lavished on them. It's said that King George III and his wife Charlotte even allowed her to address them by name rather than honorific. She knew how to work her audience. All the while, revolutionary sentiment was growing in the colonies, and Wright was an ardent supporter, even going as far as reprimanding the king for refusing to granting independence. She quickly recognized that the warm relationships she'd cultivated with members of Parliament gave her access to information her fellow patriots would find useful. Using sculpted heads and busts as cover, she sent several messages to Franklin, detailing her conjecture on which influential British leaders might be persuaded to take up the patriot cause. Wright's candor and relentlessness seem to have backfired on her after the events of Lexington and Concord in 1775. While her egalitarian manner of relating to her patrons might have been endearing to nobles and the king in the past, her strident refusal to stop talking about the Revolution made her persona non grata in society. Left without her pipeline of sources, she became less useful as a spy, even as she reportedly pleaded with Franklin to support a British rebellion against the crown. It's not clear how she made a living during the first years of the Revolution, but a move to Paris in 1780 was largely unsuccessful. Returning to England two years later, she continued beseeching her former patrons in America for opportunities to sculpt the Founding Fathers. Some sources say that only George Washington responded favorably, but Wright died before they could arrange a sitting. Interestingly, the only work of Patience Lovell Wright's that survives is of William Pitt, Earl of Chatham, a supporter of American independence. And despite her reported desire to be buried in her beloved United States, she rests somewhere in London. Rachel had pleaded with both Congress and her sister's former supporters in America for funding to bring her remains back; her requests went unanswered. As a kid, I was always looking for parallels: if there were North, South and East Brunswicks, where was West Brunswick? Same for the Oranges: South, East and West were there, so where was North Orange? And if my curiosity had ventured a little further south, I might have observed that there was a Long Beach Island, so a Short Beach had to around somewhere. Short Beach, circa 1839, courtesy Library of Congress. Well, yeah, it was. Once. And it was a vacation destination before LBI ever was. Way before. As in, George Washington could have slept there, had he ventured to the very southernmost tip of Long Beach Island. Not that the Father of our Country ever spent the night there, but had he wanted to, there would have been a bunk waiting for him. Today, though, that bunk and the island it would have stood on are gone, wiped from the map almost 90 years ago. This very first resort on the New Jersey shore dates back to sometime around 1740, when a man named Ephraim Morse settled on Short Beach, bringing cattle to graze on the island's abundant salt hay. He appears to have made some extra money selling provisions to mariners who sheltered in the nearby bay during storms, and the summers eventually brought visitors who camped on the beaches to enjoy the shore breezes. Turbulent conditions eventually forced Morse and his wife from the island, after they lost their five children and house to a relentless winter storm. Reuben Tucker's luck would be a bit different. After buying the land from Morse in 1765, he built his home and lodge on the highest point of the island, about five hundred feet from the shore. Attracted by a terrain of salt hay and maritime forest, Philadelphia-area game bird hunters and fishermen were more than happy to ventured through the Pinelands via stagecoach to get to the island for a sportsman's holiday, sailing the final leg of the trip from what became the town of Tuckerton. The inn grew in popularity as word of Tucker's hospitality grew, drawing Philadelphia Quakers who held camp meetings on the property for several summers after the Revolution. 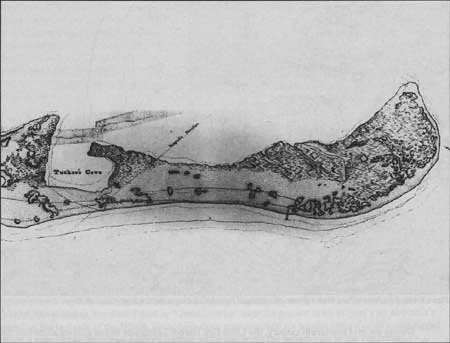 Tucker's inn continued to draw visitors well into the 1800s, despite the continuing erosion that cut off a third of Short Beach to create Little Beach. With none of the riprap, jetties or dense development that somewhat anchor the barrier islands today, storms and the tides continued to shift the sands dramatically. When the inn burned down in 1845, the Tucker's Island (or Egg Harbor) Lighthouse was built on the same site, starting what became a somewhat complicated relationship between the island, the U.S. Lighthouse Board and mariners attempting to navigate the area's inlets. The location seemed to be among the few places on the small island that seemed safe for construction, but the light itself was dim, and conditions within the inlet generally discouraged seafarers from approaching at night. When the towering Absecon Lighthouse was lit in 1857, Tucker's Island Light was extinguished. The decision was fated to be temporary, with the lighthouse put back into service ten years later. Despite the shifting sands, the Lighthouse Board built a new keeper's house in 1879, topped by a lantern light. By that time, several homes and inns had been constructed on the island, as well, along with a school and a lifesaving station. Still, the fates seemed not to have made their minds up about Tucker's Island or the lighthouse. Sands continued to shift, reuniting the tiny island with Long Beach Island and then forcing them to part again for good in 1920. Eventually the shifts began to take their toll on what man had built, and structures began to wash away with the sand beneath them, leaving the lighthouse as one of the few buildings left behind. Finally, what seemed probable became inevitable. The Lighthouse Service ordered the decommissioning of the light in September 1927, and a few weeks later, the waves toppled it into the sea. If you visit the Tuckerton Seaport and Baymen's Museum's faithful recreation of the light, you can see dramatic photos taken as the building toppled off the last remains of its foundation, falling almost intact into the water. Though Reuben Tucker's Inn and the lighthouse are just memories now, the story of Tucker's Island most likely isn't over. The ocean, as we've seen in recent years, tends to have its own plans for New Jersey's barrier islands, and rumor has it that Tucker's Island is once again emerging among the shifting sands. Given what we've learned about building on sandbars, though, I'd venture to guess that we won't be seeing much new construction when it appears.